Add another 8" drum pad to your Nitro Kit with the Alesis drum pad expansion package and enjoy a wider range of sounds from your module. Its rubber pad delivers a great response and feel for a natural drumming experience. It's a breeze to set up-simply mount it to your Nitro rack and you're set to go. Everything you need comes in the box. It is not compatible with the DM6 Nitro rack (1 1/2in) or any other 1 1/2in rack kit. 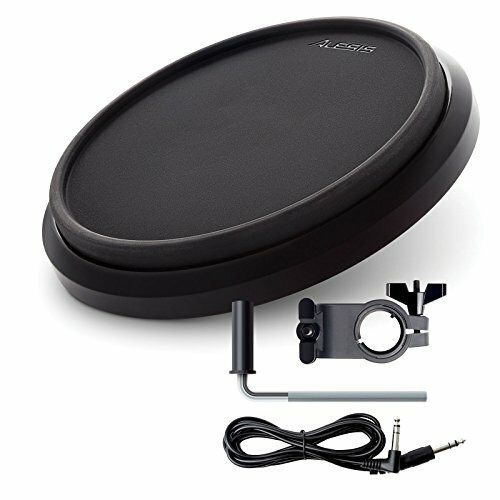 The Alesis Nitro 8 Inch Drum Pad itself works with virtually all e-percussion including DM10, DM6, DM5, Trigger|iO, ControlPad, plus many Roland, Yamaha, Simmons and other E-drum sets - Provided you have your own 1 1/2" rack clamp, easily purchased from a wide variety of vendors. If you have any questions about this product by Alesis Nitro, contact us by completing and submitting the form below. If you are looking for a specif part number, please include it with your message.